A rare Scottish League Championship medal from the early days of Rangers Football Club has sold for £7,700. The fifteen-carat gold medal was awarded to fullback George Ormond at the end of the first of his three seasons at the Club in 1911/12. Ormond went on to win another league championship with Rangers the following year, eventually moving to Greenock Morton in 1914. The medal, which had an estimate of £2,000 to £3,000, was one of the highlights in McTear’s Works of Art auction on Friday 31 August. 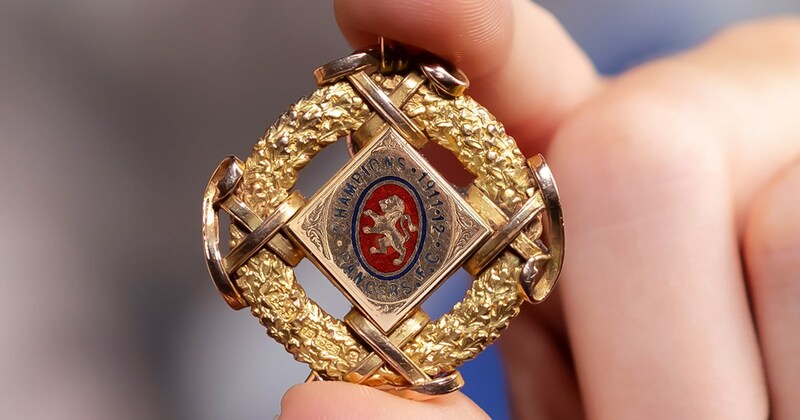 The lot was presented in its original fitted case and has a centre enamelled with a lion rampant and 'Champions 1911–12 Rangers F.C.'. The reverse is inscribed with 'Scottish Football League, George Ormond', within a laurel wreath. Commenting on the sale, James Bruce from McTear’s, said: “There was a lot of interest in the medal beforehand so we knew we were in for an exciting auction. On the day we had a number of bids in the saleroom, online and on the telephone, with an anonymous private collector eventually securing the lot. George Ormond played in defence for Rangers for a total of 65 games before moving to Morton for six seasons. It is believed he was one of three Morton players engaged in government work during WWI, which could have contributed to him not being called up. The player was involved in 179 league and seven Scottish Cup games for the Cappielow club before finishing his career at Arbroath in season 1920/21. The selling price quoted above includes buyer commission and VAT thereon.